Michaelâ€™s NeW! CD and latest production, Michael Gregory Jackson Clarity Quartet â€œWHUNUFINDITUWILLKNOWâ€� is set to be released on February 8, 2019 featuring Michaelâ€™s stellar Danish quartet! This release includes pieces Dedicated to Geri Allen, Jessica Hagedorn, Baikida Carroll, Fred Hopkins & Bruce Kevin Jackson. One of the most influential guitarists to emerge during New Yorkâ€™s avant-garde loft jazz scene has returned to influence a new generation of edge- pushing, genre-hopping musicians. Heâ€™s also returned, after a few decadesâ€™ detour aka Michael Gregory courtesy of â€œThe King of Pop,â€� to his original name and performance moniker â€“ Michael Gregory Jackson. Michael Gregory Jackson was barely of his teens when he served as co-commander of the Oliver Lake Quartet, one of the most critically acclaimed and far-traveling ensembles working jazzâ€™s outer fringes. Michaelâ€™s brilliant technique on electric and acoustic, flavored with quicksilver runs, volume pedal swells and sudden shifts from crystalline melodic to fuzzy dissonance, has been name-checked as a critical-influence, and can be heard deep in the musical DNA of six-string legends like Bill Frisell, Vernon Reid, Pat Metheny, Marc Ribot, Mary Halvorson and others. The fruits of Lake and Jacksonâ€™s post-modern Bird and Dizzy flights, often woven in a trio format with renowned drummer Pheeroan aKLaff, can be enjoyed on discs like Life Dance Of Is (Arista Novus), Holding Together (Black Saint, Shine Arista Novus), and the re- released live set Zaki (Hat-Hut) and Michaelâ€™s own solo releases of this era, his 1976 debut Clarity, Circle, Triangle, Square (Bija; reissued 2010 on ESP) and Karmonic Suite (IAI). Michael Gregory Jacksonâ€™s journey from the avant-garde to what the industry regarded as a more commercial, song- based sound was thankfully and intriguingly gradual. It gave fans with inquiring taste a ringside seat to an evolution that unfolded subtly over a series of superb albums, ones that continue to be favorites of critics and his fellow musicians. As the 1980s unfolded, Michael dropped the Jackson (to avoid confusion with we all know who) and moved further towards commercial sounds, as a performer, producer and session man, with releases like the synth-heavy What to Where RCA/BMG and Situation -X, Island, the latter produced by Grammy Award winner producer Nile Rodgers, an acknowledged fan of Michaelâ€™s guitar and songwriting prowess. During this era, his talents as guitarist and vocalist also adorned projects by folks who might seem unlikely partners for the one-time outre guitar god. He collaborated with Steve Winwood, who recorded on Michaelâ€™s Situation-X, and with Walter Becker of Steely Dan fame, in addition to other rock headliners. Throughout the 90s and 00s, Jackson continued to evolve his own sound with releases like Way We Used to Do (Tip- Toe), Red and Towards the Sun (both Golden/iTunes). Dense horn-driven clusters have given way to a stripped- down, largely acoustic sound, with multi- tracked guitars, wide harmonic chording and alternately soaring and quiet vocals, on some songs imparting an almost alt. folk feel that might reside in your record collection next to Nick Drake. The sound may have been influenced by his idyllic surroundings, his chosen homes in western Massachusetts and Maine. Like many veteran musicians, Michael Gregory Jackson has most recently quenched his wandering creative spirit by making his recording more of a cottage industry, and by helping to point, in the right direction, a new generation of genre-hopping musicians in his role as educator.Over the last two decades, Jackson has taught and led creative workshops at wide variety of institutions in the U.S. and abroad. These include the Berklee College of Music, New England Conservatory of Music, CalArts (California Institute for the Arts), Woodstockâ€™s Creative Music Studio and The Copenhagen Conservatory of Music in Denmark, which have led to his most recent recordings. Michael is poised to reclaim the mantle of the god of jazz guitar avant. 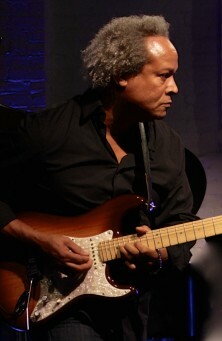 As the guitarists he influenced with his early avant-garde palate have continued to widen the ears of the listening public, Jackson has again returned to this style and experimental jazzâ€™s center stage â€“ New York City, where he has been connecting with both old compatriots and a younger generation of players. Over the past decade, Jackson has increasingly performed at such venues like John Zornâ€™s Space, Tonic, Roulette, Spectrum and during the annual Visions Festival, at a much- anticipated reunion of the Oliver Lake Trio alongside his original cohorts, saxophonist Lake and drummer Pheeroan aKLaff. Jackson has also hit the European festival circuit, performing in ensembles led by another longtime partner in sound, Pulitzer Prize finalist, Wadada Leo Smith, for whom he produced two noted and critically acclaimed discs released on Cuneiform Records, Spiritual Dimensions (disc 2) in 2009 andHeartâ€™s Reflections, in 2011. Michael recently played on one of Smithâ€™s new releases on TUM Records and several other new projects. He also recorded with London based drummer Kikanju Baku and tuba player Joe Daley on Endogeny and Exogamy, released in 2016. The guitarist currently performs, records and tours with several of his own ensembles, including his CLARITY Trio, which features Rakalam Bob Moses on drums and a changing line up of bassists. In 2017, he released the album Spirit Signal Strata, recorded with his trio featuring drummer Kenwood Dennard and bassist Keith Witty. Simultaneous with his current work in the USA, Michaelâ€™s been collaborating with musicians in Denmark, recording and releasing several albums and touring in Europe. His newest release, which comes out February 8, 2019 on Golden, is WHENUFINDITUWILLKNOW by the Michael Gregory Jackson Clarity Quartet, which includes Niels Praestholm on bass, Simon Spang Hanssen on saxophone and flute, and Matias Wolf Andreason on drums. The quartetâ€™s first album, After Before, came out in October 2015 to critical acclaim, and was accompanied by a tour. Prior to that, Michael collaborated with the A r t E n s e m b l e S y d , a creative ensemble from Denmark, for the album Liberty (2013 Embla Music). The disc, which includes seven Jackson originals, compelled jazz author Bob Gluck to write â€œThe music is deeply touching and even heartbreaking. It defies categoryâ€¦I cannot stop listening to this recording. It is that goodâ€¦â€�. Michaelâ€™s other Scandinavian collaborations include performing and recording duets with Simon Spang-Hanssen for an upcoming album, Essence Breaks Free. Active as a composer, performing musician, and educator, Michael is performing solo, duo, trio and large ensemble concerts, producing recordings and teaching at various institutions in Europe and in the USA. Heâ€™s toured as a member of drummer Ra-Kalam Bob Mosesâ€™s Heart Breathe Trio, and in January 26, served as guest composer and guitarist for a performance at Gateway City Arts by John Kordalewskiâ€™s 13-piece Makanda Project. In addition, heâ€™s finishing a project of songs with lyrics called Breathe and editing a book of his poetry titled Poems Righting Me. Performed and/or Recorded With:Julius Hemphill, Mick Jagger (Rolling Stones), Oliver Lake, Will Calhoun (Living Colour), David Murray, Matt Shipp, Nile Rodgers (Chic, Daft Punk), Wadada Leo Smith, Carlos Santana, Bernard Edwards (Chic), Vernon Reid (Living Colour), Billy Hart (Wes Montgomery, Wayne Shorter), Nona Hendryx, Kenwood Dennard (Dizzy Gillespie, Wayne Shorter, Herbie Hancock), Buster Williams (Herbie Hancock), Steve Winwood (Traffic), Keith Witty (Anthony Braxton, Amel Larrieux, Somi), Nels Cline (Wilco), Walter Becker (Steely Dan), Anthony Braxton, Rakalam Bob Moses, Patti LaBelle, Kenwood Dennard, Anthony Davis, Jack Dejohnette, Anton Fig (Letterman Show), Melle Mel, Omar Hakim (Weather Report, Sting), Jerome Harris, Eddie Henderson, Amina Claudine Myers, David Sancious (Bruce Springsteen, Peter Gabriel), Obie A ward Winner Ntozake Shange, Rodney Holmes, Jimmy Bralower, Nona Hendryx, Kevin Jones, Jessica Hagedorn, Ed Blackwell (Ornette Coleman), Steve Thorton (Miles Davis), Anthony Jackson, Gary Bartz (Miles Davis), Tony Thompson (Robert Palmer, Led Zeppelin), Sammy Figueroa (Miles Davis), Kermit Driscoll (Bill Frisell), Ole Romer, Bernard Davis (Sam and Dave, Mariah Carey), Marty Ehrlich, Karl Berger, Ingrid Berger, Henry Threadgill, Baikida Carroll, Victor Lewis, Thulani Davis, Jeff Bova, and many others. Michael is proud to endorse Pigtronix Pedals, Fishman Triple Play, Reunion Blues Gig Bags and Godin Guitars.